All of a sudden I was craving for cake and with this unplanned craving I will usually use whatever that I have in the kitchen. Definitely will not go for grocery shopping to pick up extra ingredients..LOL! If I'm going out then might as well go to a decent cafe and have a cake..haha! This cake is so simple and awesomely easy, and surely a fail-proof cake. Everything can be done in one bowl - yes just in one bowl and no mess or hassle for washing after the cake is popped into the AirFryer. I used a big mixing bowl and put all the dry ingredients in it and in a separate measuring cup for all the wet ingredients - mix both together and AirBaked it to perfection. And yes, it is as simple, quick and easy as that - no complicated steps! Don't say I didn't warn you and please be prepared for the AirBaked Almost-Famous Chocolate Cake! 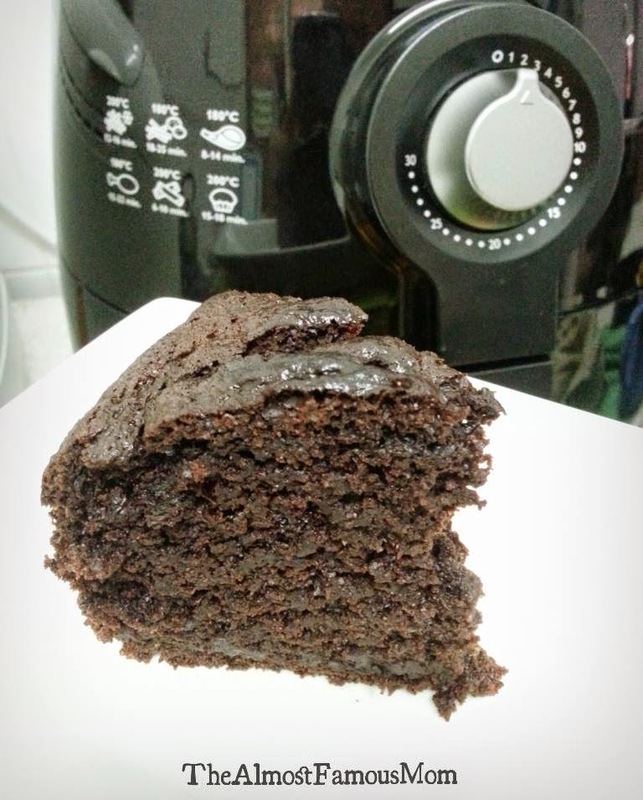 This recipe yields an outrageously overload rich chocolate cake that is insanely moist - to all the chocolate lovers in the house...this is for you! No matter how you slice it, it is always outrageously overload with chocolate and indeed it is a super quick way to squelch any cake and chocoholic cravings! 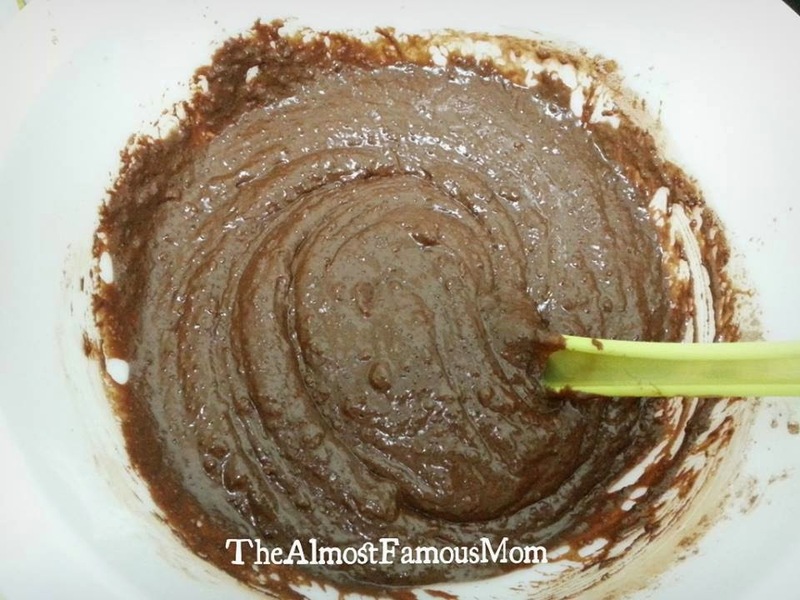 In a large bowl, stir together all the dry ingredients (sugar, flour, cocoa powder, baking powder, baking soda and salt). Add in the egg, milk, oil and vanilla extract to the dry mixture. Gently stir the mixture to mix it evenly. Lastly, add the hot water (you can use plain hot water). Again, gently stir it to make sure the mixture are mix evenly. Don't panic when you see the batter is thinning! It is normal and all good. 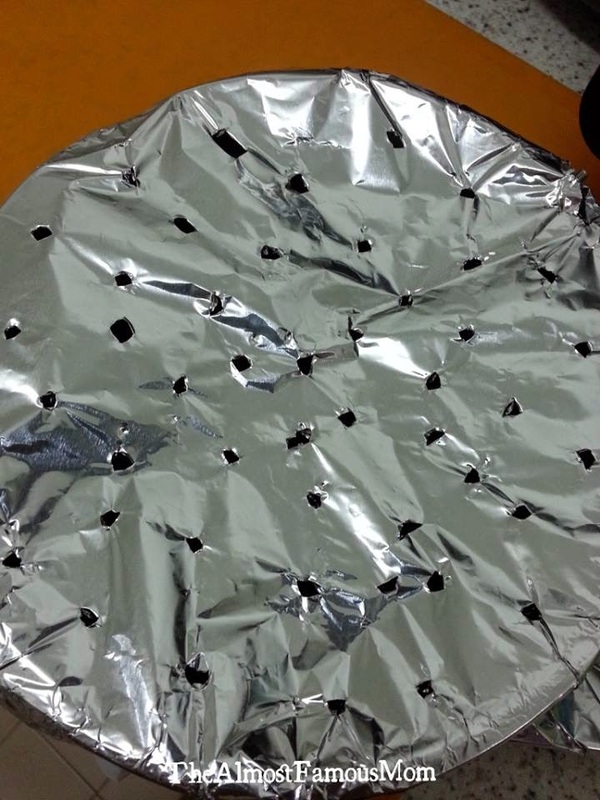 Pour the mixture into the baking pan and cover the baking with foil and randomly pokes holes on it. Place the baking tray in the basket. Adjust the temperature to 160°C and AirBake it for 35 minutes. 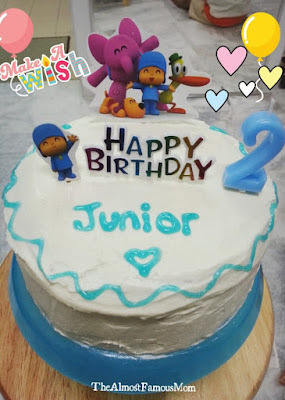 Because this cake is so popular and it is one my son's favorite cake.....so I've decided to bake it again for his birthday and decorated with his favorite cartoon - Pocoyo(and with Cream Cheese frosting)! Happy Birthday Junior! Mommy is very proud of you! 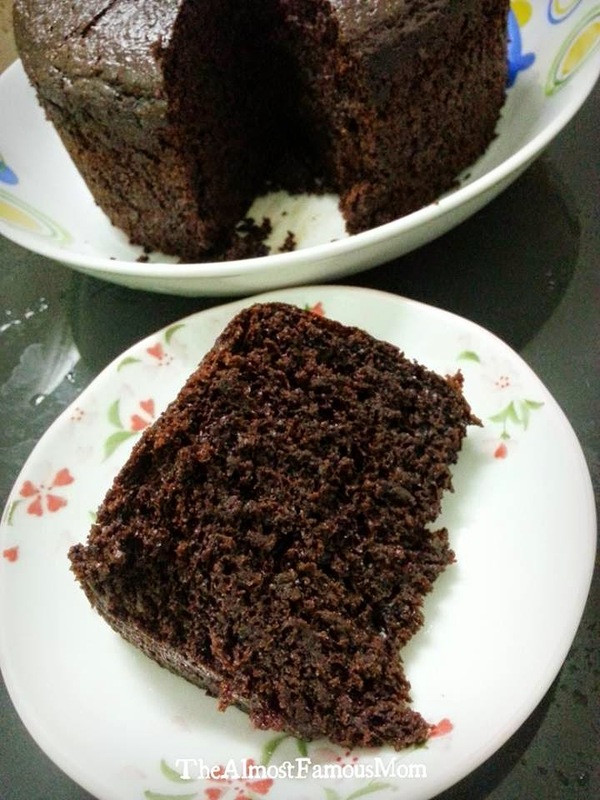 Hi, ur Choco cake recipe looks awesome. I want to try making also. But as a newbie baker, can I ask how many ml is 1/2 cup? Hi SC, 1/2 cup of water is equivalent to 118ml. Hi, may i know wat size baking pan are you using? The baking pan size is 6-inch - this is the accessory from Philips for the Airfryer. Another thing you might want to watch out for is the amount of batter you pour to the bread maker pan, from my experience if the batter is too much then the cake will not cook thoroughly (middle part will still be wet). Hi Samantha, your recipe looks really good! 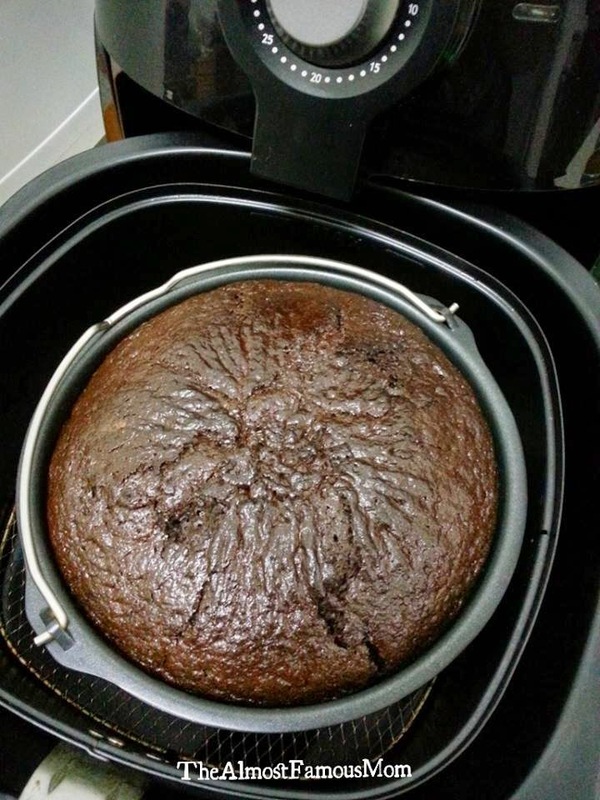 I just tried baking a brownie cake using AF, but sadly it turned out rather dry both on the outside and inside. 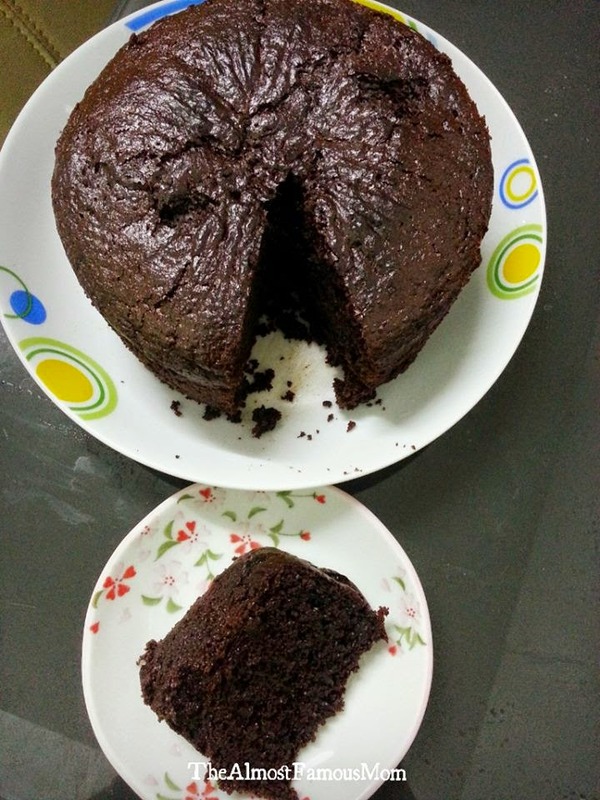 :-( Hence, i thought I'll give your recipe a try as your cake looks really moist from the pics! 1) Why do you use baking powder and baking soda at the same time? 2) Can I replace the vegetable oil with butter? 3) Can I use SR instead of AP flour? 4) Why do you use hot water and how hot should it be? 5) At which point do you add the instant coffee mix? 6) Why do you cover the batter in tin with aluminium foil and remove it later in the baking process? 7) Where did you get your round baking tin from? 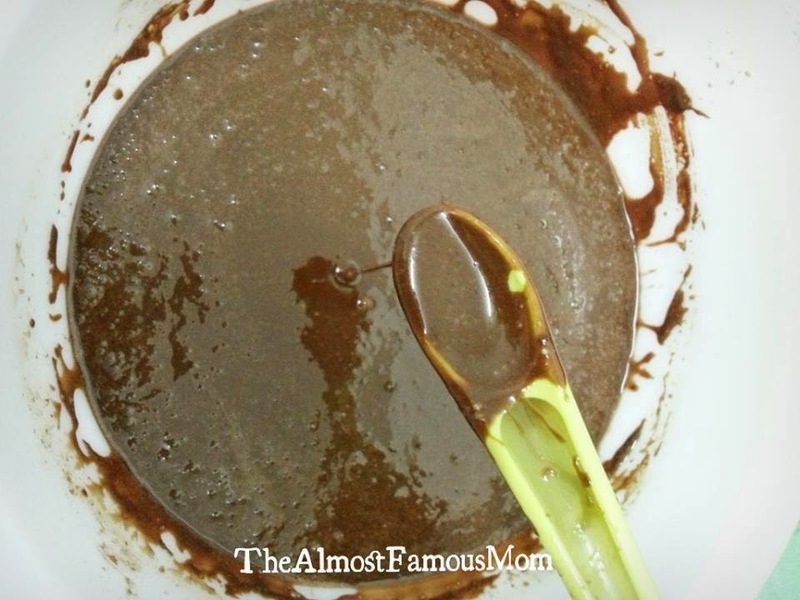 Do you happen to have a recipe for chocolate ganache to go with the brownies? 1) This is very chemistry..LOL! Baking Soda needs acid to activate so your cake can rise whereas Baking powder is actually baking soda mixed with just the right balance of another acidic ingredient (so you don't have to worry about having enough acid in the recipe). The reason why both soda and powder are used because you might have enough soda to neutralize the acid in the recipe, but not actually enough to lift the batter. In this case, a little baking powder will give the extra lift needed to make this recipe perfect. 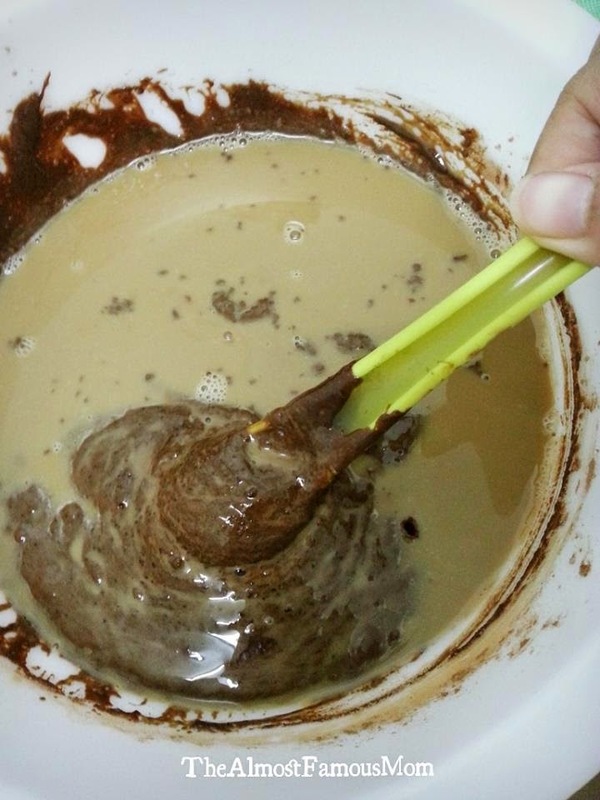 You could use baking powder alone, but then your finished baked cake might taste too acidic. 2) You can use same quantity of melted butter. 3) Because the recipe already called for Baking powder and soda so it is not advised to use SR flour. Alternative to AP is Cake flour. 4) I used hot boiling water (mine was about 90C). Adding the hot water will make the batter watery (having enough liquid) and resulting the cake to be moist and soft. how long can we keep the cake? If I baked it tonight do i keep it in the fridge? I intend to let my kids bring to sch the next day (1 in am session n the other in pm session). 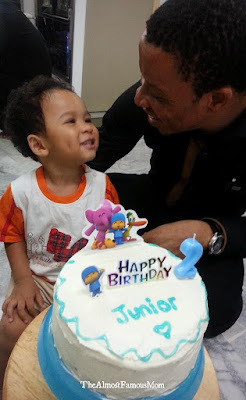 My cake does not turn out soft, The texture is very chewy. This is my first time doing baking. I wonder why....maybe because of all these? 1) I replace the AP flour with cake flour. 2) my milk is too cold? It is directly from the fridge. By the way, I use the normal baking pan with removable base (first time buying this), the cake mixture leak out when I pour in. Should I layer it with baking paper first? But the cake shop lady told me no need. Aih.....very sad! usually use cold milk in my baking unless stated otherwise so that should not be the contributor for your dry cake. As for the egg, i think as long as the egg is not rotten still okay and usually doesnt have effect on the cake texture (esp drynees). 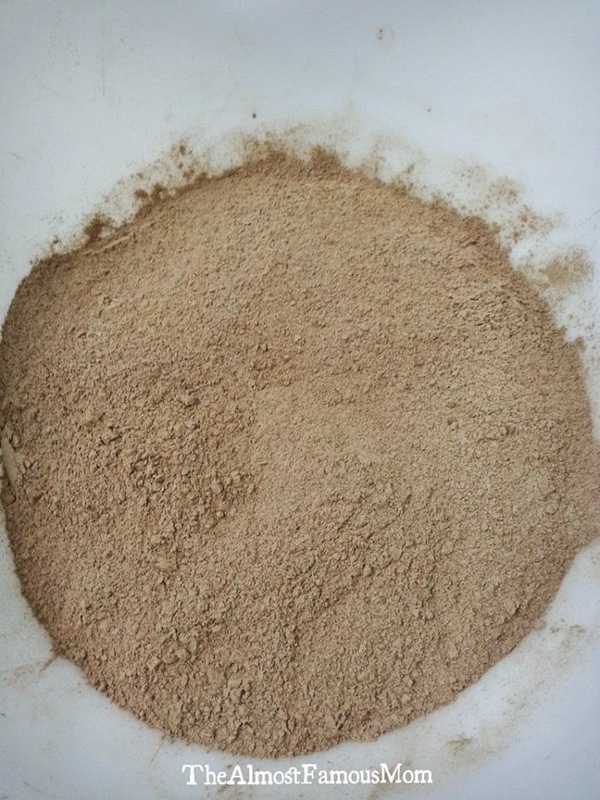 Cocoa powder also not an issue as long as you reduce the amount of the sugar to balance the cake sweetness. So I suspect the main culprit that caused your cake to be dry was the Cake Flour. Cake flour is a low protein flour (6-8%) which means it contains more starch and less protein compare to AP. Cake flour will require a little more liquid because it is mediated primarily by swollen starch granules with some structural help from egg proteins to form a cake. 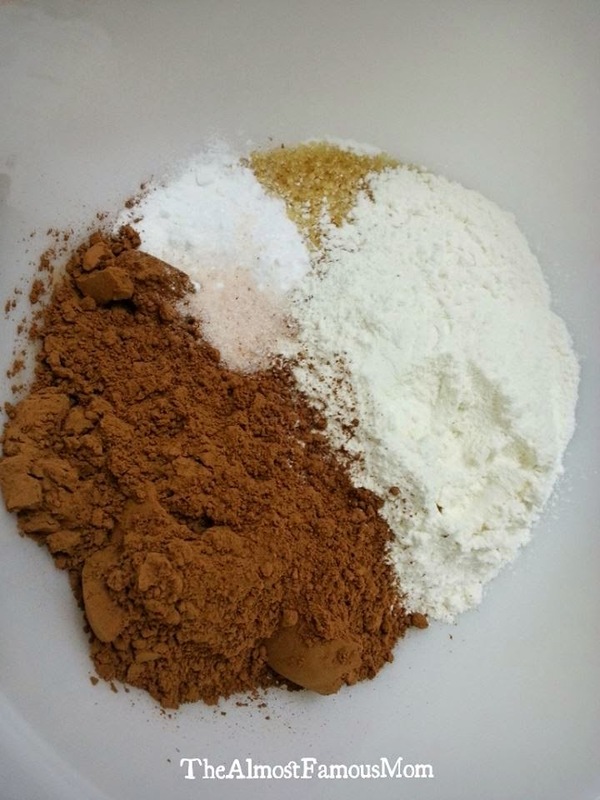 AP flour contains more protein (11%) so it will require less liquid and resulting cake structure is held together with more of a flour protein network. Cake made with cake flour will be more drier and more crumbly/sandy compare to cake made with AP. 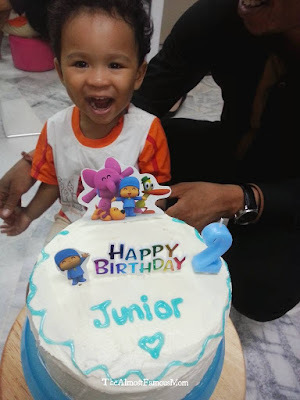 The cake made with cake flour will also be more compact and less spongy compare to the the all-purpose flour cake. Can I use plain flour to make the cake? What's the difference between the two types of flour? Hi Samantha.im using the manual type of air fryer.wondering whether i can use the square baking tin accessory that comes with my air fryer instead of the round one u used? Do you have recipe for chocolate ganache for this cake? Hi, My cake also becomes a bit chewy like kueh. Is this normal? hi! 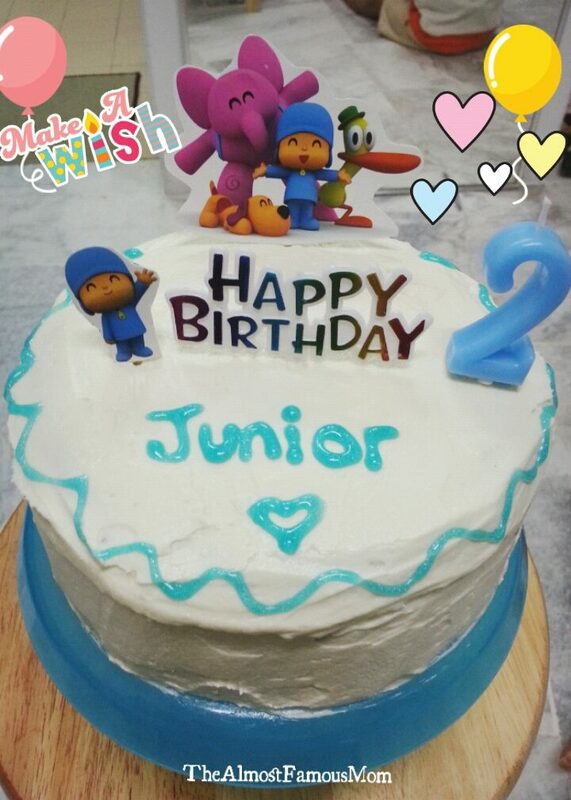 it is suppose to have the cake texture (quite moist texture), Chewy texture could be due to over-baking. It happened to me once when I didn't take out the cake when the timer rings and leave it to sit in the AirFryer for another 10 minutes or so...the cake turned out dry and chewy. Thanks so much for this recipe - this cake is sensational!!! Instead of using the hot water at the end I use a 1/4 cup of fresh espresso and about a third of a cup of fresh squeezed blood orange juice. I also added the zest of two blood oranges - so the cake has a subtle but really lovely coffee-orange flavour. I've tried the receipe,and i don't know which went wrong.I've followed the receipe correctly but sadly the center of the cake did not cooked properly. Hi Ct, Ouuhh....sorry to hear about your cake. The cake can be under-baked for few reason....the baking pan size or temperature differences. But my first guess here will be the baking pan! The measurement is good for the Philips Airfryer baking pan and if you wanted to customized it to fit your pan, you will need to be sure that the batter is only half way up to the pan or else the cake will be under-baked (especially in the center (the batter is too thick to be baked). Good luck and keep baking! It's an art as well as a science and takes time to learn. Hi samantha...can i make a vanilla cake, in the same procedure, but just omiting cocoa powde?? Wil it turn out moist n good...or u hv beter sugestions or a total new recipe fr it?? Thnk u!!! Have you ever use this recipe and bake in an oven? What temperature should I use for oven instead of airfryer? Hi Wee, I have never tried using oven to bake the cake. You can definitely try it out with oven, the temp should be around 175-180C for 35-40 minutes (or until the skewer comes out clean). Hi from Chicago! Baked your cake last night. Fun to weigh ingredients with my food scale and convert C to F, not used to that. Had to improvise because I didn't have the right pan for my Avance basket. I'll try again when I purchase a different pan and throw in some espresso baking powder from Williams-Sonoma. Looking forward to leftovers today. Thanks for posting! Hi Sam, I m newbie, May I know what kind of milk should I use for baking? and why do you use vegetable oil instead of butter? any diff? Hi there! I used regular UHT milk for baking (straight from the fridge). 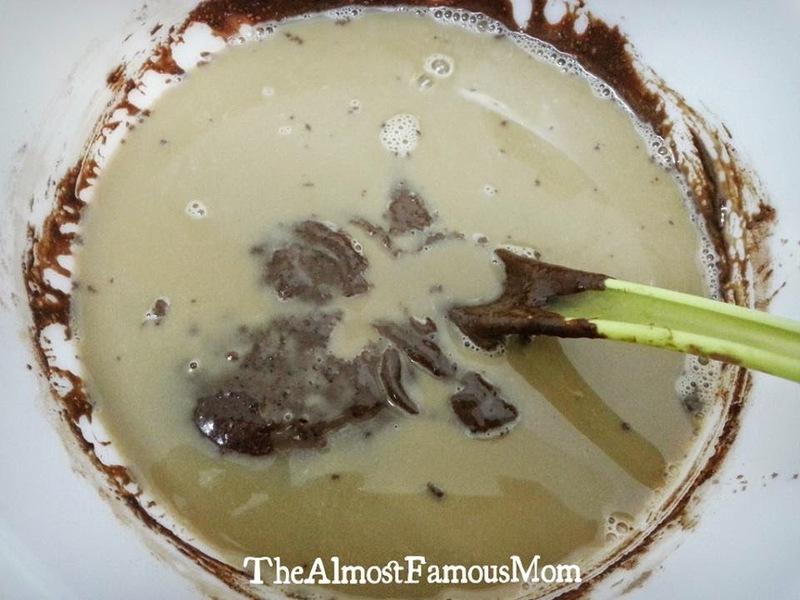 You can use melted butter to replace the vegetable oil. Oil makes a tender cake that retains its moistness. Baked your chocolate cake. Yummy & soft. Thanks. Love your visual instructions. can I use oil in the white cake instead of butter? Hi Jade, you can definitely substitute with oil but you need to watch out for the measurement as you will require lesser oil ratio. Hi K, I'm using the regular Airfryer (not XL). If you are using smaller baking tin then be sure the cake batter is not over-fill to avoid overflowing cake. Hi Samantha. If i want the cake size to be doubled, meaning my ingredients also need to be double too right? 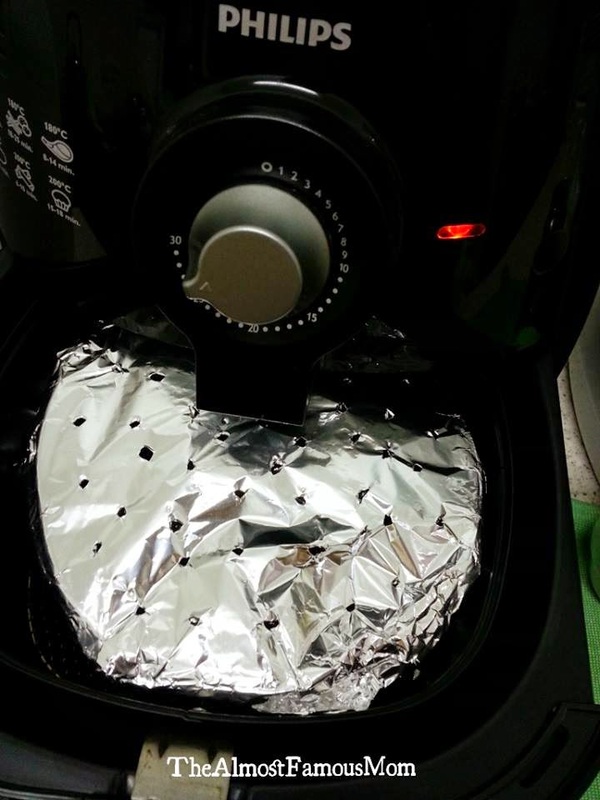 Hi can baking pan for cake in airfryer havells ok? Hi Avinash, any baking pan that fits in the Airfryer is okay to use. Hi there! I tried ur recipe and the cake really taste good. It's so easy to bake! However I have a problem.. 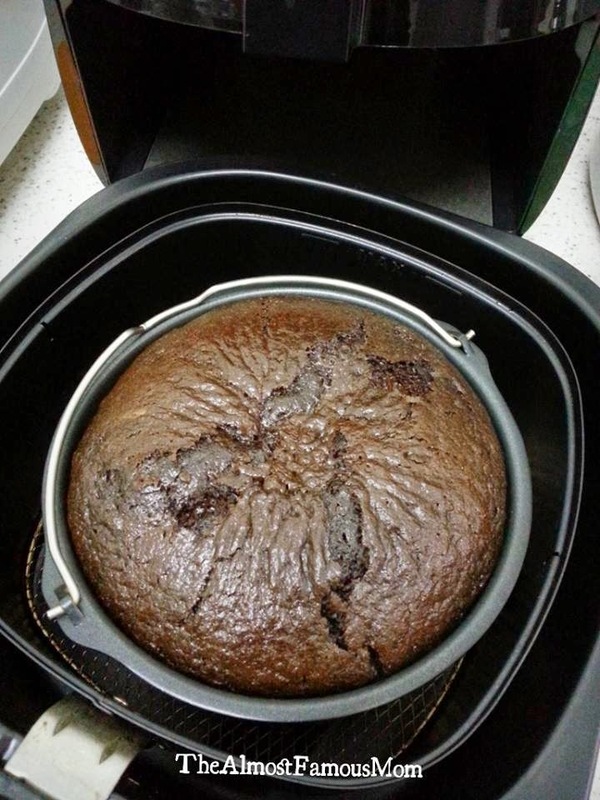 It's very difficult to remove the cake from the airfryer baking pan. My round cake turned out a little out of shaped the moment I removed it from the pan. So sad! How can I improve? Should I add baking paper or butter the pan first before adding the batter in? Thanks! I have just made this for about the sixth time to take to a dinner party for desert - it's just brilliant. Hai...can v use normal sugar instead?? This is one of my favorite chocolate cake recipes. I can whip it up any time for friend's or colleagues' birthday. I call it one bowl chocolate cake. I don't bake with AF but my conventional oven. I've just made this cake the second time in a week. Very easy and quick. With this second bake, I substituted the oil with butter to give it more taste and also thrown in some chocolate bites. Let's see how it goes. Looks good though. Hi my cake doesnt raise up.what could be wrong? Followed same receipe and only Subsituted oil with butter. It was heavy and dense. Used xl air fryer. Followed receipe except for oil that was subsituted with butter. I made this cake and WOW it is awesome and your directions are spot on!!! 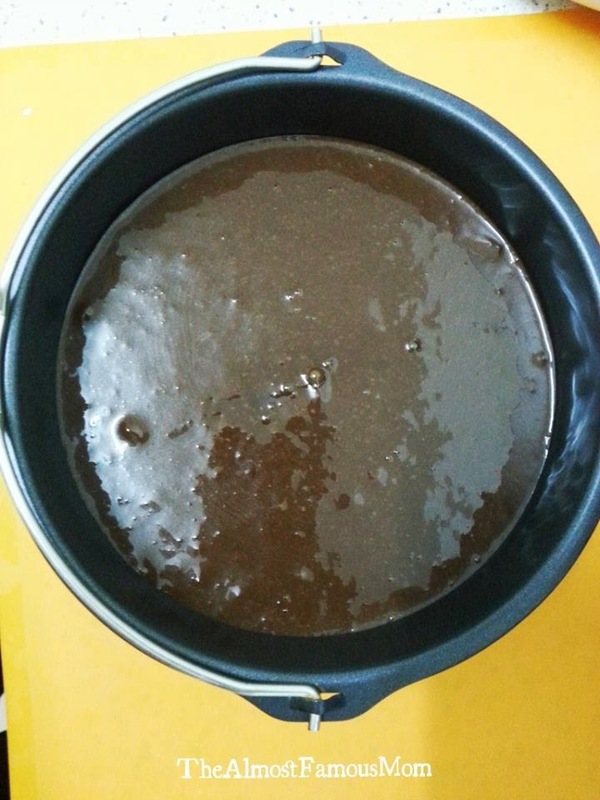 hi Samantha, i would like to bake this choc cake using keto way. Do i just substitute the same gm AP flour with Almond/Coconut Flour? any other ingredient need to change? tqsm. Awesome idea! I never thought of revising my old recipe into keto-friendly!! I will try to experiment this recipe because it is my fav! thanks for the idea!